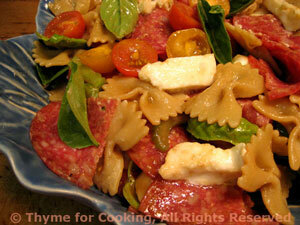 Caprese Pasta Salad with Salami, easy summer salads. This is a variation on the Italian classic 'Caprese', turning one of my favorite salads into a one dish dinner. Salami packs an enormous amount of taste into a very small package. The Balsamic Vinaigrette enhances the sweetness of the salami and the mellowness of the mozzarella. Slice mozzarella, then cut into 1/2" (1.25cm) cubes. Drizzle in olive oil, whisking constantly. Add vinaigrette to pasta and toss to combine. Add tomatoes, celery, mozzarella, salami to pasta and toss lightly. Top with basil leaves and serve.